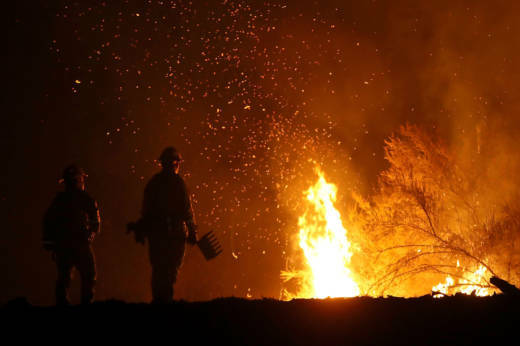 Officials in Glenn County, in the northern Central Valley about halfway between Sacramento and Redding, are enforcing some mandatory evacuations after the Mendocino Complex Fire spread an additional 8,895 acres overnight. Cal Fire Public Information Officer Derek Tisinger said his team is expecting fire activity to increase again Monday afternoon with strong winds and warmer, drier conditions. "We're going to have westerly winds," Tisinger said. "This will increase the rate of fire spread to the east, especially as it lines up with the topography, such as drainages and canyons." Tisinger said the blaze is currently nearly 80 percent contained. The mandatory evacuation order covers the southwestern part of Glenn County, including all areas west of County Road 306 to the Lake County line, south to the Colusa County line and north to Forest Road 20N07 (also known as County Road 308). Glenn County under-sheriff Todd James said the evacuation order affects the Snow Mountain Wilderness, a 60,000-acre tract of land in Mendocino National Forest. It’s a mostly forested region with only around 20 residents. James said the residents have all been alerted and urged visitors to stay north of the town of Elk Creek. "Don't go south, because everything's closed," James said of the evacuated area, which is a popular hunting spot. "People will be either cited or arrested if they're found in the closed areas." The Mendocino Complex Fire has burned more than 390,000 acres and is the largest wildfire in California history.